We all experience stress on a day-to-day basis, right? Stress could be something small that can be easily fixed or something big that can leave you wanting to pull your hair out. So what are some of the healthy ways you manage your stress? As you noticed, I said “healthy ways.” If you said deep breathing, using humor, or even exercising — you have a very healthy way of managing your stress. What about meditation? Is that something that comes to mind? Believe it or not, meditation has been around for thousands of years. It has continued to become more popular in today’s busy and stressful society. Now anybody can download a smartphone app to practice meditation anytime, anywhere. You don’t need a temple on top of a mountain to practice a meditation technique. Meditation is a mind and body practice that focuses on the cooperation not just between the brain and the body, but also the mind and behavior.1 Meditation allows you to focus your attention on just one thing instead of focusing on other thoughts that are keeping your mind busy and causing stress.2 There are many types of meditation out there, but they all have the elements of a location with few distractions, a relaxed posture, a focus of attention, and the mindset of allowing distractions come and go without judging.1 Just to warn you, it does take practice to become really good with mediation, especially with keeping focus on your breathing or your go-to word. 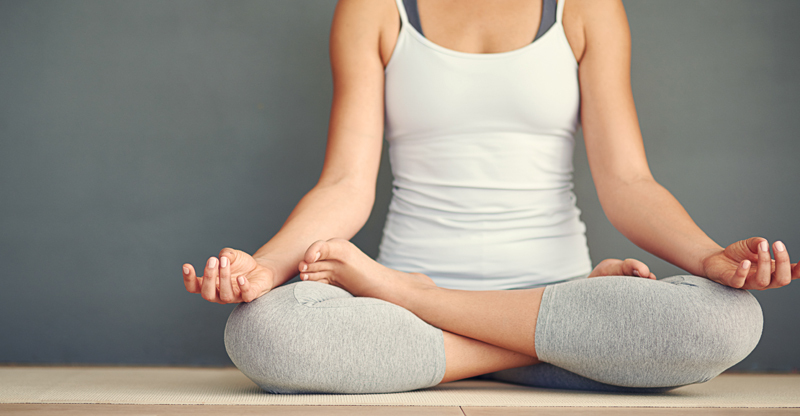 There have been a number of studies on the benefits of meditation on our health. Studies have found that meditation can change the brain wave patterns from patterns of high activation to patterns of relaxation that can help manage and improve our health. When the brain is in a relaxation pattern, it allows the stress hormones to lower in the blood.1,2 Put it this way: Meditation is like a cool-down for your mind, just like a cool-down after a good workout for your body. Those are some of the benefits of meditation. Remember, there are many types of meditation — so it could take time to find the one most suitable for you. Meditation takes practice, so be patient. You will not become a master of meditation in one day. Lastly, meditation does have a lot of health benefits, but at the same time it can’t be used on its own to treat a medical condition. Make sure you consult with your doctor. Positive self-talk: You can do it.